Jason asked me about a month ago if I would be willing to speak about what the Bible says regarding the wife’s role in marriage. Ladies, either my sweet husband just REALLY believes that you would be best served from hearing from a woman OR he is just REALLY afraid of upsetting you and that is why he asked me to speak to you. I am not sure which, but here I am. I truly appreciate the opportunity and the trust my husband has in me and the opportunity that he has given me today to talk to you about this really cool God ordained role called WIFE. 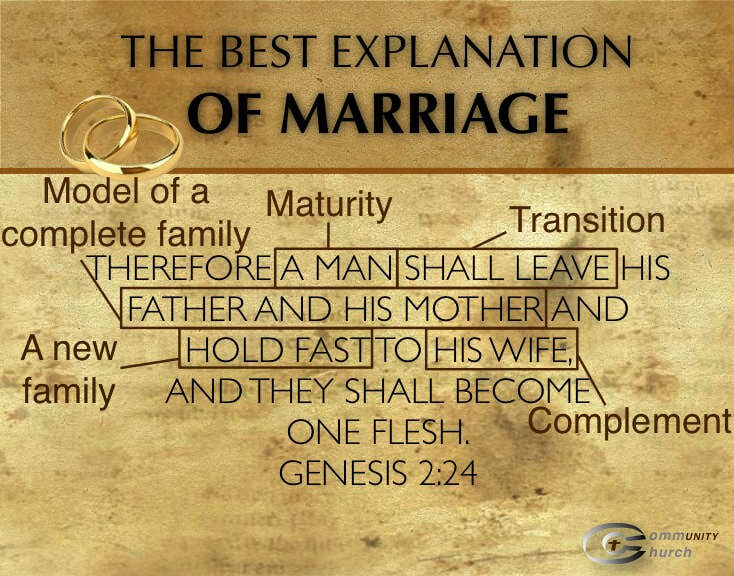 As I was thinking about this, I questioned why we need to have a 7 weeks sermon series on how to have a better marriage? Shouldn’t it just come naturally? I mean after all we married our knight in shining armor…right ladies? I did! Here is why we need a 7 week series on how to have a better marriage, because as Romans 3:23 tells us that there is sin in all of us. Even popular psychology says that we as humans have own individual needs and desires and we want those needs and desires to be met and out of our needs and desires come our behaviors, both the good and the not-so-good. I’m going to give you the most important point right now: If our heart is not filled with Jesus’ love and if we aren’t seeking HIS guidance through his word and prayer, there is NO WAY we are going to have Christ-like behaviors in our marriages. Do you believe that? Humanly speaking, our sin nature wants to satisfy itself. We want to satisfy us. If we aren’t in the word learning about Him and we aren’t trying to change to be more like Jesus everyday, then the attitudes and behaviors that will come out of us will be focused on ourselves. And if we are the main attraction in our life well then the marriage relationship will suffer. I heard a statement a couple years ago while in Biblical counseling training at Faith Church in Lafayette that really sums the human heart up well. This question goes through my mind frequently when I’m struggling with my own thoughts, my actions, my mouth, and the question is this: why do we do what we do? The answer is because we want what we want. The heart is so important. When our heart’s desires are misdirected, our behaviors are sinful. The attitudes and behaviors that come out of that are dissatisfaction, anger, resentment, bitterness, nagging, criticism…do I need to go on? But here is the good news: if we know Jesus as our Savior, then we have the power of the Holy Spirit living inside of us! The same power that raised Jesus from the dead! As the Scripture tells us, with Jesus we can do all things. If we seek Him and allow Him to work in our hearts, our behaviors will change to be more Christ like, which should be our daily goal. I want to set the record straight here, because over the past couple weeks Jason has commented twice that when he asked who wanted a better marriage, I was the first one to raise my hand. Yes!! I raised my hand, and I will raise my hand every single time. You want to know why? Because the marriage relationship is a picture of our covenant relationship with Jesus Christ. That’s a BIG deal. You should all raise your hand every time, because we all have room for improvement in our relationship with Jesus, and in our marriage. I want my relationship with Christ to be better every day, I want to be closer to Him, I want to be more like him, so yes, I want my marriage to reflect that as well. There is ALWAYS room to change our hearts to be more like Jesus. So, ladies as we talk this morning about the awesome role of the wife in the marriage. Keep this mind: if you are falling short of what God says you should be, and you start feeling like you’re a terrible wife, and you’re not measuring up, and on and on, you need to go back to what I mentioned earlier - that if you know Jesus, you have the Holy Spirit - a supernatural tool to help you with being what God wants you to be as a wife. We are going to start with looking at Genesis 2:18. Ladies, we are all REALLY aware that our husband can’t function without us! God knew it too! He created us for the purpose of being a helper to our husband. Your husband is not complete in God’s design without you! We need to revolutionize this idea of “helper.” I’ve never really liked that, because I’m a strong woman - I can do this, and that, and I’m not the “maid” or the “waitress”! I think we don’t really understand how significant of being a helper to our husband is in God divine plan. The Bible frequently describes God as a helper. If God is described as a helper, then it’s pretty amazing that he thinks we should be described as a helper to our husbands. Let’s revolutionize that word, and empower ourselves to be God’s helper, to be our husband’s helper. Ladies it is our God-given role to come alongside our husbands and help them. We are different then they are, we have different thoughts, different perspectives, and God designed you specifically to use those things to complete our husband. So, if you think your husband is a mess, help him! Don’t complain about it, help him. Men, you’ve been hearing from Jason about your role and should know by now what you need to do. I’m coming at this from the other side, and saying that you need to understand that God gave you your wife to help you. Don’t think you can do it all your own, because God didn’t design it that way. If you are not going to her, if you are not letting her help you, then you are outside of God’s design! We have a great example of a helping wife in scripture. This is THE example in the Bible of the helping wife. Whether you love her, hate her, are afraid of her, or think you can never be like her, the Proverbs 31 woman is pretty stinking awesome. I grew up in church, and I got tired of the Proverbs 31 woman. I hear Christian women say, “please no more Proverbs 31 woman, is there nothing more? !” It seems so out of reach to be that kind of woman, but this is what God has given us! However, I want you to think about her in a different light. Around the 1970’s began the women’s movement. The “I can do it all” woman. I can have a career, I can have fulfilling family, respect from my husband, my children, my community. That wasn’t a new movement, the Bible beat it by thousands of years! She is such a cool woman! Don’t fear her! She is doing it all, and she can do that because she loves God. So don’t hate her, emulate her. We’re going to start with Proverbs 31:1-9. My boys have heard this from me a thousand times. The first nine verses are about King Lemuel, and what his Mama taught him about what he needed to know. 2 What are you doing, my son? What are you doing, son of my womb? 8 Open your mouth for the mute, for the rights of all who are destitute. 9 Open your mouth, judge righteously, defend the rights of the poor and needy. She’s telling him “don’t waste what God has given you! Don’t follow women who will take you away from your goals. Don’t drink so much that you forget your job, to govern wisely as king. Don’t waste it!” If you ever want to date my boy, ladies, this is what they hear all the time. I want them to put God first in their life, and I want them to have a wife who will put God first and pull them away from His plan for them. Verse 10 cracks me up, because it says, “Who can find this woman? !” She is far more precious and rare than jewels. Proverbs 19:14 tells us that this woman is a gift from God. That’s where you find her! I also think it’s funny that verse 20:6, says “Who can find a faithful man?” - God doesn’t leave you guys out, either. Young men, if you are not married, what are you looking for? Good-looking, smart, funny...what do you think about? Because I don’t recall my boys or their friends ever say, “Oooooh! That girl has virtue! Oh my!! She fears the Lord! !” No, I hear “She’s HOT!” - and I hate that word. But Proverbs 31 is all about the kind of woman you should be looking for. This is what God has ordained a wife to be, so I’m giving you everything you need to find your wife! Her husband trusts her. He has absolute confidence in her integrity. He knows he can leave and everything will be taken care of, because her family is the most important thing to her. Ladies, do you give your husbands reason to be suspicious about you? Or to worry about your intentions, or about what you’ll do? Can he trust you with the checkbook, credit cards? What’s coming in the front door, are you taking out the back? Does he know without any doubt that you will not bring harm to him or the family financially? The ideal wife is a good steward and handles family finances well. She does it because she loves him, and she is submitting with her heart, not just her actions. She does him good and not harm. She has her husband’s best interests at heart She builds him up, wanting him to be the best he can be. But she also lovingly confronts his sin, and his weaknesses. Why? Because she loves him, she completes him, she is his helper. Are you kind with your words when your husband is being a complete you-know-what and you know he has sin in his life that you need to help him with? Is your heart submissive? We can be everything on the outside, we can do what we’re supposed to do, follow through with everything God has called us to do on the outside, but if our heart is not submissive, if our heart is not doing it in a submissive manner then we have a problem. A man’s reputation is built by his wife! Everybody knows who this man is because his lady made certain it was that way. Other people know him because she makes him look good. She helps him with his spiritual development, with clarity in life’s issues, she doesn’t tear him down or talk poorly about him, because she is faithful to loving him he is free to be who God created him to be. He trusts her with every part of who he is. Ladies, do you talk poorly about your husband to your family, friends, or coworkers? Is that building up his reputation? I’ve counseled a lot of ladies who ask, “Well then who am I supposed to talk to?” You’re supposed to talk to God! And to your husband! That’s who you take your pain to, your concern to. If he is being the Godly man he is supposed to be then he will be there to work through it with you. I also get the question, “Well you don’t know my husband. I can’t go to him. He’s not living like he’s supposed to, and he doesn’t really care.” My answer to you is, Fill your heart with Jesus. The only way that you are going to be fulfilled in any way is if Jesus is the most important thing and he is filling your heart. He will get you through those tough times. for her household and portions for her maidens. She is the ruler of her house. She manages it, is engaged in planning careful management. It’s not easy stuff she’s doing, she works hard! I came across verse 15, and thought, “Yes!” You know what this verse tells me? She didn’t do it alone, she had help! But she takes care of them and is kind to them. The beauty of all that hard work she does to make her home what it should be, is that she finds joy in it because she loves her family. She sacrifices herself for her family. She doesn’t complain, she doesn’t do it out of duty. What drives her? Her heart. Verse 16 says she’s an entrepreneur. She makes money and uses it for her the betterment of her family. She’s independent. She thinks it through, makes decisions, and purchases things. Her husband trusts her with those decisions because he knows it’s only for the betterment of him and their family, not for her own gain. She makes wise investments. This career of hers, where she’s making and selling things, doesn’t come at the expense of her husband or children. In my own life, I struggled with this a little bit. I went to graduate school, and got an amazing job. I was very, very driven to be all I could be. That is okay, but my heart was focused on ME. What could I do, where could I go? To the point that I would leave on Monday mornings, drive to Nashville, TN and live there all week and come home on Fridays and be with my family on the weekends. I did that for almost a year. All the while thinking, “This is what I went to school for. God gave me these brains, and I’ve got to be at the top of my game.” Never really considering that my husband was suffering, my kids were suffering, my home was suffering… At the end of that year, God gave Jason the opportunity to be an associate pastor in Ohio, and we moved. I was still doing that same job because I could fly out and go wherever I needed to go. Then I had the opportunity to take a new job close to home there in Ohio...and then God moved us again. There is so much I could share about how much we learned that year, how much grace, so much teaching that whole year was for our whole family. I was really the only one with a paycheck at that time, Jason was full-time as a pastor and we had taken a $70,000 a year pay cut, we still had a home here and a home there, we were moving back here and I had this job that was supporting us, and I said, “I’m done. I’m not going to work.” And Jason was like, “What?” He freaked out a little bit, but God had touched my heart and showed me that my priorities were wrong. It didn’t matter if I lost my house and everything I had, if I didn’t get my priorities back in order and put God, my husband, and my children first then I wasn’t representing myself as the Godly wife that he wanted me to be. So for about 4 years I worked part-time, God worked through me, and now I have an opportunity where my family is always my first choice. If you are career-minded, ladies, you have to also be God-minded and think about what He wants for you. It’s not about you having your rights, and being able to do whatever you want, because clearly we can - but if you choose to be married, then you have to have your priorities in order. She’s community-minded. She makes sure her family is provided for, but she’s not hoarding it - she opens her house and shares what she has. She's serving the poor and counseling others. So she's come alongside his ministry, she's a partner with him, sharing her wisdom with others. You know why she laughs at times to come? She’s not fearful of the future. Why? Her thoughts are eternal, on God and not on the things of this earth. If you struggle with worry, and “where is it going to come from?” change your thoughts. If you focus on God and eternal things, he’s going to take care of you. She laughs at it. Can it be said of you ladies that when you open your mouth it’s with kindness and wisdom? I know it can’t be said of me all the time! Are we complainers, worriers, nags? I can be all those things and I’m sure you can, too. If you’ve been wondering where the recognition for all this hard work comes in, this is it. If you’ve been thinking, “What about me?! I don’t always want to be in the background. I don’t always want to be hidden. I don’t always want to be making some man look good! I want to look good! I want people to talk about me!” - here it is. This is the earthly reward for all of the work of the other verses. What more could you want? Her satisfaction in life is coming from the people she loves most - and they love her! She gives them everything, and they give everything back by praising her. Why? Because she gives them reason to. The husband should praise her, and teach his children to praise her. He should teach the children well, so they say, “Thank you, Mama, that on cold days I'm warm. Thank you, Mama, that on cold days I have hot food.” When you have a woman like this you should talk about her all day long. You should say, “Thank you. Can't live without you. I need you. I enjoy you.” All the people you meet should know how good your wife is. Go public with this woman, don't keep her in the background! There's no privacy here. The wife is to make her husband look good, and the husband is to take his wife public with him. We can look really good on the outside. She made fine linen and purple, she looked good! It’s okay to look good on the outside, but she made sure that she looked good on the inside, that her heart was right. She wanted to be all she could as a wife in order to honor God first. You can cover up pretty well a really ugly heart. It’s easy to cover up, but what this mother was telling her boys was that they needed to find a woman who fears the Lord.